Helping someone in need, trying to make the world a better place, and having empathy towards people who are downtrodden and struggling to meet basic needs in life are noble aims that are close to many people’s hearts. These are aims that transcend boundaries and unite us in spirit, and it is the theme on which humanity is founded. Some people try to bring that difference in people’s lives in their own small ways, while others do it in an organized way through social service. Whatever is the way, we all are united in spirit to make this world a better place to live in. This pushes us beyond our limited selfish nature and makes us expansive, so we give with a big heart and transcend towards the Divine. Often, those who really want to make a difference in the world engage in social service. It is a means to help the underprivileged and those in need. Social workers say that they take joy in empowering those who are in difficult situations or suffering and that by doing social work, they are able to make the world a better place even though there is so much pain around us on a day-to-day basis. While social work is challenging, social workers often report feeling fulfilled by improving the lives they touch. Many social workers have spiritual beliefs and their beliefs can be a part of what propels them to help others through social work. Some people also do social service as a part of their spiritual practice based on Karmayoga (Path of Action). 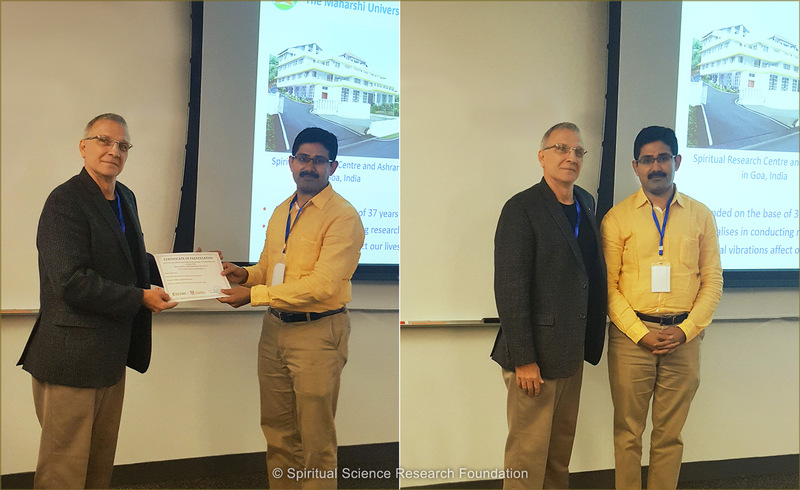 At SSRF and the Maharshi Adhyatma Vishwavidyalay (Maharshi University of Spirituality or MAV), we studied the spiritual principles underlying social work. 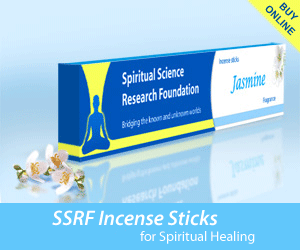 The aim of this research was to clearly present the spiritual aspects of social work. We will be covering these principles in more detail in a future article series on SSRF. 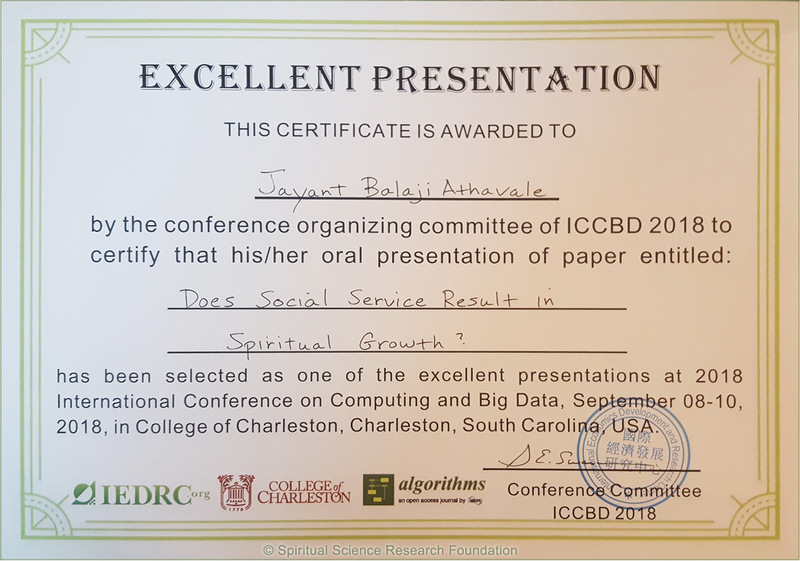 With God’s grace, we got the opportunity to present this research at the 7th International Conference on Knowledge, Culture, and Society (ICKCS 2018), South Carolina, USA on 9 September 2018. The paper was authored by H.H. Dr. Athavale and co-authored by H.H. (Mrs) Bhavna Shinde and Mr Sean Clarke. It was presented by Mr Krishna Mandava and was received well by the panel and the audience. The conference hosted more than 20 general and 4 Keynote presentations. Our presentation had over 20 attendees who were scholars and professors from various fields and many different countries. The conference was categorised into presentations on Data Science & Big technology, Computer science & Applications, and Social science, Culture & Management. Attendees shared that the matter and knowledge in the presentation was unique. They mentioned that we had the best PowerPoint presentation and pictures. One presentation from each of the main categories received one “Excellent Presentation Award” and our presentation received the “Excellent Presentation Award” under the Social science, Culture & Management category. Professor Gary E. Swanson, who is an internationally recognized highly acclaimed educator, photojournalist, producer, and director who also owns Dimage Studios in the USA mentioned he thoroughly enjoyed the presentation. He especially liked the pictures and PowerPoint. He awarded us the certificate at the end. A professor from the USA wrote on an ID card that he is also a seeker of God and would like to speak about the topic further with us. Another professor from the USA mentioned that he is studying mental health and the spiritual research conducted by us would be of interest in his research. One professor from Nigeria said he can relate to all the points and the world needs to invest in the true self and whatever is best for society rather than investing only in material progress. He said that from the topic it seems thinking about others is one way to get started in spiritual practice. Before the topic was started he said would like to attempt to answer the question given in our topic “Does social work result in spiritual progress?’ He answered “No” saying the intention behind one’s actions is important. While having breaks during lunch and coffee during interactions with Ph.D. holders, they asked many interesting questions about Mr. Mandava’s goal and purpose in life, if destiny can be changed, if people in 3rd world countries are mentally happier than in the USA, the reasons for greed, can anger be reduced, etc. Despite having all the highest degrees in education, the attendees felt the need to take refuge in something more meaningful to experience sustained happiness, i.e. the Divine. It is due to God’s grace that we had the opportunity to share about this research, so the spiritual aspects of social work are clarified. Some of you may have the sincere desire to help others and be drawn to social service as a means to do so. While it is certainly admirable to have this desire, we encourage you to familiarise yourself with the spiritual principles underlying social service so the social work you perform provides the maximum benefit. You can start by reading our article on the spiritual aspects of social service. 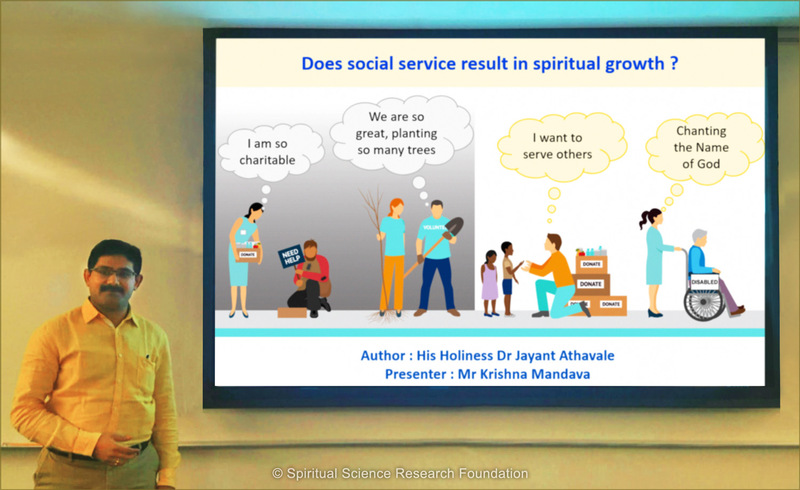 Understanding the spiritual principles underlying social service will enable you to progress spiritually through the social service your perform, fulfilling the spiritual purpose of life. You will also be able to help those in need at a spiritual level, which is the most lasting form of help we can offer to others.